Quha Pufo is a wireless puff switch for Quha Zono. It is attachable to the neckband, making Quha Zono even more versatile as a head mouse. 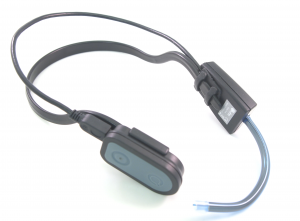 Quha Zono is a wireless computer mouse that is used by limb or head movements. Quha Zono is easy to use, accurate and small in size. Quha Zono and Quha Pufo are compatible with common computer, tablet and smartphone operating systems including Windows, MacOS, Linux, Windows RT and Android. Zono Pufo puff switch for Zono mouseQuha Pufo puff switch is quickly connected to Quha Zono — no additional power or configurations are needed. The mouthpiece is easily adjustable to each user and replaceable for hygiene. A little puff to Pufo’s mouthpiece will perform a left mouse click, and two short puffs will perform a double-click. The dragging can be easily done with a long puff. The Pufo includes Quha Pufo puff switch, ten replacement mouthpieces, and an illustrative user manual.